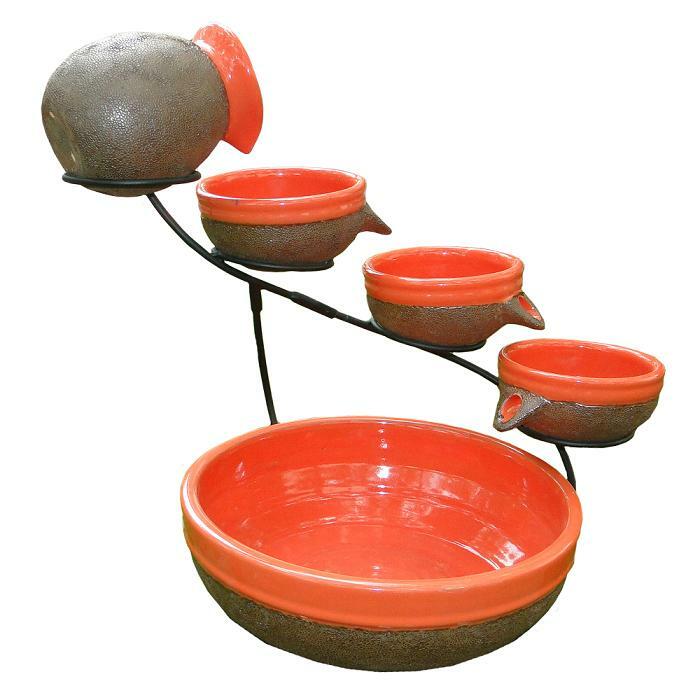 This tangerine cascade solar water fountain features rustic brown finish ceramic bowls trimmed in tangerine with a four tier cascading solar water system. The solar panel has an extra long 10 ft. cable so you can place your panel where the sun is and the fountain where you want. This four-tiered Tangerine Cascade Solar Water Fountain recycles water using solar power; a low voltage pump is powered by a remote solar panel, which operates when placed in direct sunlight. Water is carried up to the top jug and flows back down to the main bowl through 3 small bowls. Creates sound of gentle running water anywhere in your garden, patio or deck. Easy to install and setup.